Coping with celiac disease: how heavy is the burden for caregivers? 1Center for the Prevention and Diagnosis of Celiac Disease, Gastroenterology and Endoscopy Unit. Fondazione IRCCS Cà Granda. Ospedale Maggiore Policlinico. Milan, Italy. 2Gastroenterology and Endoscopy Unit. Fondazione IRCCS Cà Granda. Ospedale Maggiore Policlinico. Department of Pathophysiology and Transplantation. Università degli Studi di Milano. Milan, Italy. Author contributions: Ferretti F and Elli L designed the study, interpreted the data and wrote the manuscript. Branchi F and Ferretti F enrolled patients and collected the data. Dell'Osso B collected and interpreted the data. Conte D critically revised the manuscript for important intellectual content. Background: Celiac disease (CD) is the most common chronic enteropathy demanding a lifelong gluten-free diet. Objective: The aim of the study was to identify and estimate the subjective burden of caregivers of celiac patients. Methods: A cross-sectional observational study was conducted during the regional meeting of the Italian Society for the Celiac Disease in April 2014. 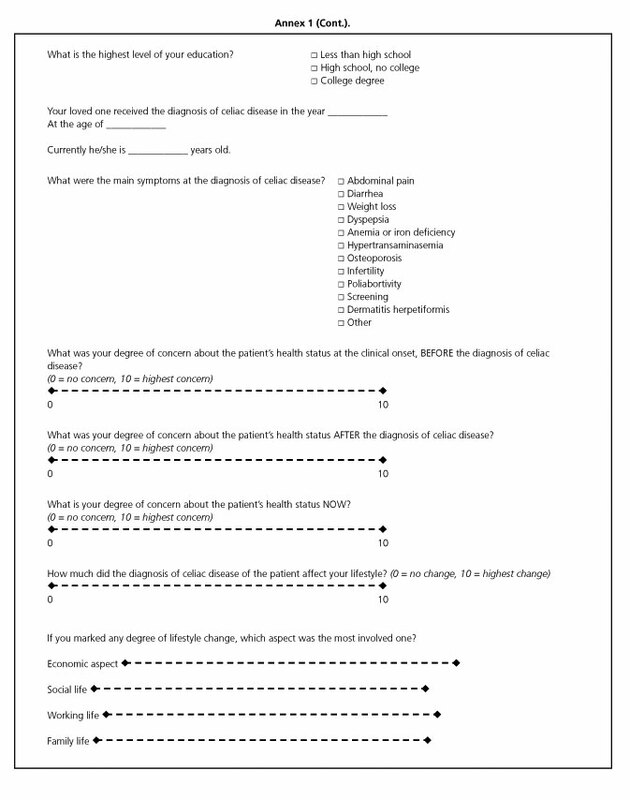 A written self-administered anonymous questionnaire enquired into caregivers' demographic profile, natural history of patients' disease and caregivers' self-reported degree of burden at the onset of symptoms (T0), at CD diagnosis (T1) and during follow-up (T2). 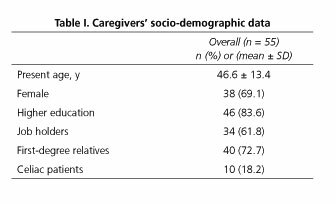 Fifty-five caregivers completed the questionnaire (69% females, 47 ± 13 years old, 73% first-degree relatives). Results: The presence of warning symptoms, such as abdominal pain, chronic diarrhea and weight loss was responsible for higher levels of concern. A statistically significant reduction of concern in the follow-up was demonstrated by the comparison of visual analogue scales (VAS) values from T0 to T2 and from T1 to T2 (6.8 ± 3.1 vs 4.2 ± 2.9 and 7.0 ± 2.5 vs 4.2 ± 2.9, respectively; p < 0.001), mirroring the reduction of distress among newly diagnosed individuals. A global impact of gluten-free diet and CD on quality of life was reported in VASs (6.7 ± 2.4). Family (5.4 ± 3.1), social (5.6 ± 2.9) and economic (4.5 ± 3.4) domains were the most associated. Conclusion: The assessment of caregivers' subjective burden should be considered as an essential step in the evaluation of celiac patients, needing a specific investigation and support. Key words: Celiac disease. Caregiver. Subjective burden. Chronic disease. Gluten-free diet. Quality of life. Chronic diseases are responsible for a significant psychological, economic and social burden, affecting several aspects of a patient's life, as already reported with regard to diabetes, cancer and arthritis (1). Besides the perspective of patients, the diagnosis of a chronic illness (especially during childhood) is challenging also for their families (2,3) and requires adjustments to multiple life domains (4,5). In the last two decades, several studies demonstrated the detrimental effects on the physical and psychological health of the caregivers of chronically ill patients (6-8), drawing the attention to their subjective burden. This has been defined as the "psychological, social and emotional impact caregivers may experience from the objective burden of care-giving" (9). As in other chronic conditions, a certain degree of information and support should be provided to the families and caregivers of celiac patients, according to international guidance (10). Celiac disease (CD) is the most common chronic enteropathy, which occurs in genetically susceptible subjects carrying HLA DQ2 and/or DQ8 genes, and is triggered by gluten ingestion (11). The CD prevalence is approximately 1-2% in Western populations (12). Currently, the only recommended treatment is a strict lifelong gluten-free diet (GFD). Considering that gluten is a constitutive protein of wheat and other grains and that baked products and pasta are staple elements of the Western diet, a high number of patients end up facing the sudden change of their eating habits and their families' daily routine (13,14). Furthermore, GFD is highly restrictive and recent data have shown that patients report a substantial treatment burden similar or higher than many other chronic conditions in spite of a good long-term prognosis (15), leading to multiple limitations in common social activities and complaining of psychological distress, anxiety and social phobia (16-18). Therefore, given its chronic nature and the possible complications (i.e., autoimmune and/or neoplastic diseases, anemia and osteoporosis), CD requires on-going medical support, which has shown to improve the disease outcome and patients' compliance to GFD (19). Consequently, significant changes affect not only patients but also their families' life. However, the burden incurred by caregivers in CD has not been assessed to date. The aim of the study was to evaluate the impact of the disease on caregivers' life, enquiring about the main domains involved and the main warning factors. A cross-sectional observational study was conducted among celiac patients' caregivers recruited during the regional meeting of the Italian Society for the Celiac Disease in Lombardy (northwestern Italy) in April 2014. Caregivers completed a written self-administered anonymous questionnaire, filling in ten multiple-choice questions and eight visual analogue scales (VASs). The questionnaire consisted of three parts (Annex 1). 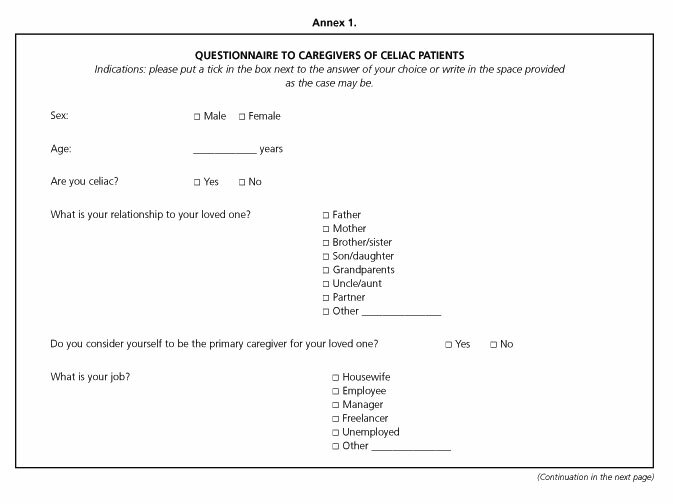 The first section identified the caregivers' demographic profile (age, gender, job, level of education, degree of kinship to celiac patient). The second section investigated the natural history of the patients' CD as age of onset and clinical manifestations at diagnosis. 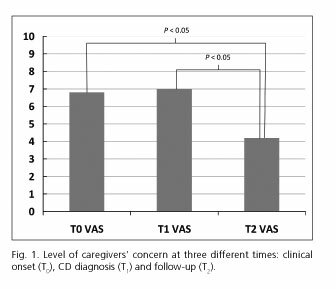 The third section evaluated the caregivers' self-reported degree of burden at the onset of symptoms, at CD diagnosis and during follow-up, assessed by means of three different VASs. Finally, participants defined their global degree of implication and addressed the extent of implications for social, family, working and economic domains. All analyses were performed using SPSS vers. 18. A p value of < 0.05 was considered as statistically significant in the endpoints evaluation (test significance level: 5%, two tails). Kolmogorov-Smirnov's test assessed the normal distribution. Categorical variables were compared by Chi-squared or Fisher's exact tests; continuous variables were compared by the independent sample t-test or Mann-Whitney's test. Tukey's range test and t-test verified significance. Correlations were analyzed by Pearson or Spearman's tests (correlation coefficient "r"). Stepwise linear regression analysis was used to identify potential predictors of a higher degree of concern. The study was performed in accordance with the Declaration of Helsinki and with the national law on privacy in clinical research (laws 571/2013 and 572/2013), waiving the need for consent from patients. Fifty-five caregivers completed the questionnaire. Their socio-demographic data are summarized in table I. Mean age at CD diagnosis was 18 ± 16 years. At the time of questionnaire completion, celiac patients were 29 ± 19 years old, reporting a mean follow-up of 11 ± 9 years. Main symptoms at the clinical onset were: abdominal pain (33 patients, 60%), diarrhea (28, 51%), weight loss (20, 36%), dyspepsia (14, 25%), anemia (25, 45%), hypertransaminasemia (8, 15%), osteoporosis (7, 13%), and dermatitis herpetiformis (3, 5%). One case was from family screening. The third part of the questionnaire included VASs, assessing the caregivers' level of concern at three different times: clinical onset (T0), CD diagnosis (T1) and follow-up (T2). As shown in figure 1, a statistically significant reduction of concern resulted from the comparison of VAS values from T0 to T2 and from T1 to T2 (6.8 ± 3.1 vs 4.2 ± 2.9 and 7.0 ± 2.5 vs 4.2 ± 2.9, respectively; p < 0.001). The comparison of T0 and T1scales did not demonstrate any statistical difference. At CD onset (T0), the presence of diarrhea, abdominal pain, weight loss, dyspepsia and osteoporosis led to significantly higher values of concern (p < 0.05). On the contrary, serological alterations such as anemia and hypertransaminasemia apparently carried a lower degree of concern (Fig. 2). Furthermore, the study of sociodemographic parameters suggested that lower levels of education and unemployment are associated to higher level of stress (p < 0.05), while caregivers' age, gender and degree of kinship did not imply any difference. Finally, those caregivers who assisted patients diagnosed more than ten years ago reported higher levels of concern. According to VAS values declared at diagnosis (T0), two groups at higher (VAS ≥ 7) versus lower (VAS < 7) degree of concern were defined. The cut-off value had been already suggested in other studies, as corresponding to a burden requiring intervention (20). In our cohort, 29 caregivers (57%) belonged to the first group. 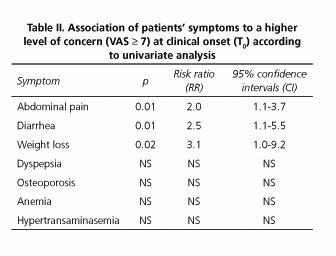 By univariate regression analysis, patient factors that were significantly associated with increased levels of concern were: abdominal pain, diarrhea and weight loss at CD onset (Table II). However, the same factors did not remain significant in the multivariate analysis. Finally, a specific analysis on the impact of CD on caregivers demonstrated a global effect on quality of life VAS (6.7 ± 2.4). Only two people did not report any change in their lifestyle. Among the different aspects examined, a higher burden in family (5.4 ± 3.1), social (5.6 ± 2.9) and economic (4.5 ± 3.4) domains was reported on VAS, while working habits were barely involved (2.2 ± 2.7). A significant correlation between the global and the specific scales was demonstrated by Pearson's analysis. To the authors' knowledge, the present study represents the first report to date to focus on caregivers' degree of concern throughout the diagnostic process and follow-up of CD. It is well established that the diagnosis of a chronic disease leads to concern and potentially leads to symptoms of anxiousness in patients, who undergo a major upheaval in their lifestyle. Several studies demonstrated the importance of caregivers in assisting in the social and psychological drama of a chronic condition and in supporting a faster recovery and higher compliance to treatment. With regard to CD, only a few studies adopted the caregivers' perspective, mainly drawing the attention to their effect on patients' quality of life and treatment adherence (21). In the clinical practice, caregivers' well-being is not routinely assessed (22). Thus, identifying caregivers' concerns and factors predicting caregivers' burden can be relevant not only for their role in GFD compliance and follow-up adherence but also in order to determine a patient-centered care plan. According to our results, regardless of the initial degree of concern, a significant reduction was observed after CD diagnosis and in the follow-up (T1 and T2 VAS), consistently with previous studies, which demonstrated a reduction of distress in newly-diagnosed individuals (23) suggesting that also among caregivers anxiety was ascribable to unexplained symptoms. As predictable, the presence of warning gastrointestinal symptoms such as abdominal pain, weight loss and diarrhea was a risk factor for higher levels of concern, while some serological alterations such as anemia or hypertransaminasemia do not significantly influence the degree of concern. Unfortunately, a predicting effect of these factors was not assessed, probably because of the restricted number of participants requiring further validation. Among the sociodemographic data, primary education and unemployment were related to a higher degree of stress, suggesting that a lesser knowledge of CD and its benign course could play a role. Eventually, a diagnosis made more than ten years ago implied a major concern; presumably, symptomatic cases and less awareness about CD could be one explanation. Although our study collects preliminary important data for the management of CD patients and their family environment, some limitations should be discussed. The selection of the study population among members of the Italian Society for the Celiac Disease is a potential bias, since caregivers attending the meeting could be more alert about patients' health than the wider general population. Nevertheless, our cohort is homogeneous and representative of celiac patients' epidemiology, being about 18 years old at diagnosis with a mean follow-up of ten years. Data about clinical history were collected through respondents' self-reports, with the risk of a reporting and recall bias, even though the study design with a cross-sectional and by-questionnaire approach has been already used in other studies (24). VAS is a simple effective tool in surveys, with different studies showing its psychometric properties for the assessment of stress, and is as valid, reliable and responsive as multi-item scales (25,26). Its application has already been validated in other gastrointestinal and extra-intestinal conditions (27-30), in order to measure the burden of the disease on quality of life. As recently described, caregivers should be considered as "invisible patients", with health and psycho-social needs of their own which have to be identified and addressed (31). According to our preliminary study, this scenario is confirmed in CD, although its prognosis is more benign than in other chronic diseases, such as arthritis, diabetes or cancer (32). 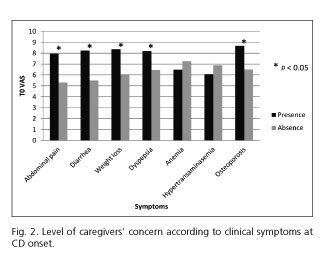 The aforementioned results suggest that the caregivers' burden should be assessed at clinical onset, when some alarm symptoms, e.g., diarrhea, weight loss and abdominal pain, might be responsible for higher degree of distress. A burden decrease is expected during follow-up. The family, social and economic aspects of life are those most affected by CD, as they will require specific support. In conclusion, in order to draw up a patient-centered care plan (33), the assessment of caregivers' quality of life and subjective burden should be considered among the essential steps in a patient evaluation in order to facilitate focused clinical interventions in chronic diseases, including CD. A special acknowledgment is given to Francesco Somalvico, who performed the statistical analysis. The language and style of the manuscript has been revised by Marcello Hinxman-Allegri, a native English speaker and experienced publishing professional. Neither the research contents nor the authors' intentions were altered in any way during the editing process. The authors had the ability to accept or reject suggestions and changes. Fondazione IRCCS Cà Granda-Ospedale Maggiore Policlinico.